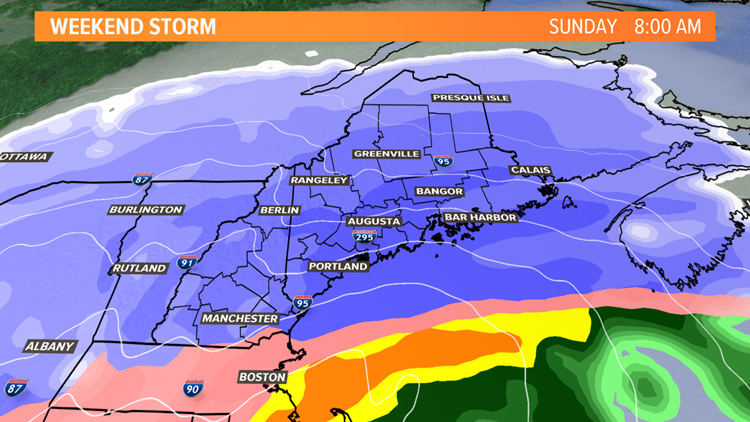 The biggest storm of the year is on the way and it's going to drop some huge snow amounts late Saturday night through Sunday night. Expect a foot, you could get two. I reserve that phrase for the big ones. This IS going to be a big one. We are still wrestling with the sleet question. Will it mix in along the coast or not? 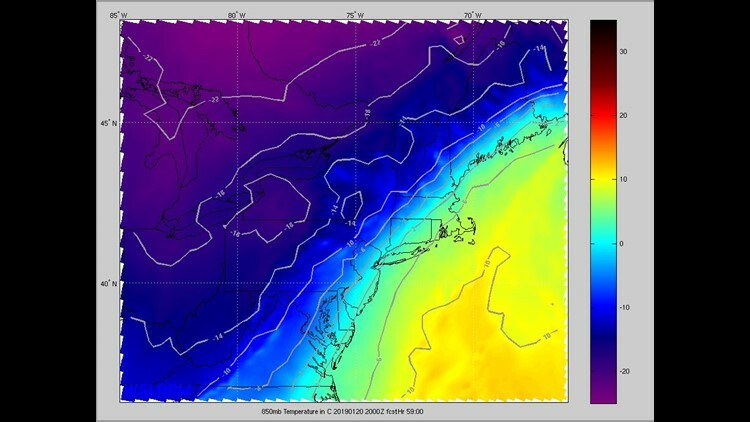 Otherwise, this is looking like pure, fluffy powder region-wide. 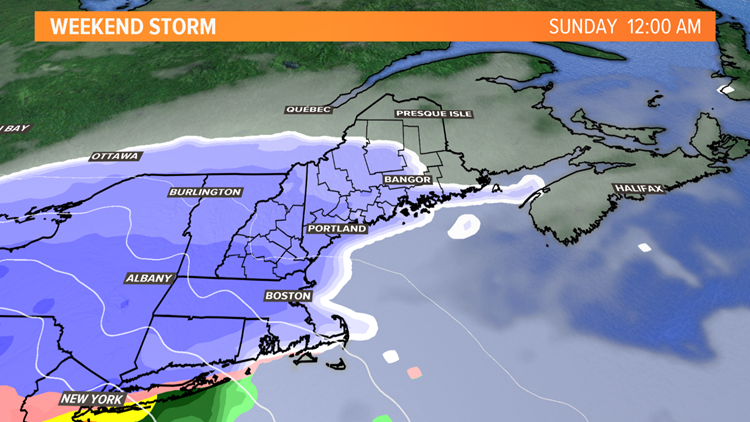 The snow will break out Saturday night, sometime around midnight on average. 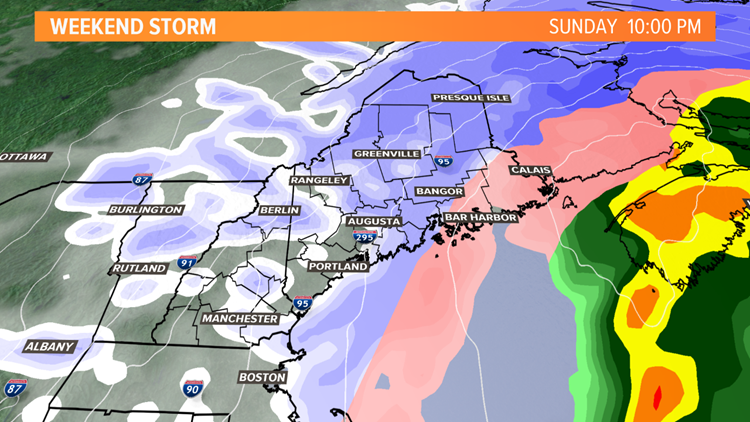 By Sunday morning when you get up there will already be several inches of snow on the ground and the snow will be cranking away. Ideal overrunning and stretching of the atmosphere will be occurring and bands of snow will line up dropping snow at rates of 1-3” per hour. Driving will be treacherous so I recommend you get all your Patriots party snacks today or tomorrow. 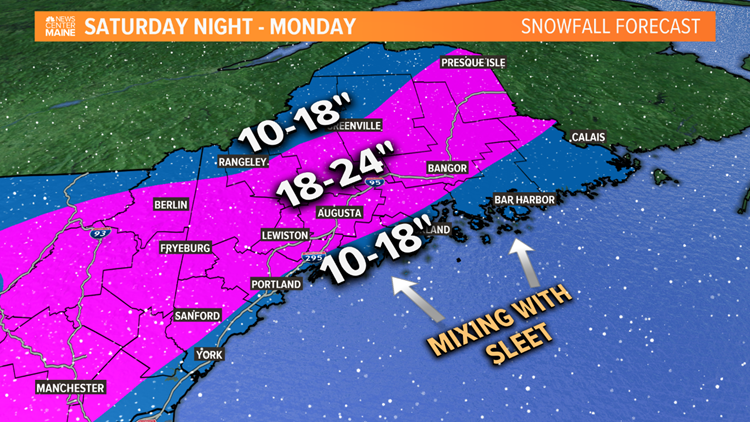 During the middle of the day, all Maine meteorologist eyes will be on the snow / sleet line. It’s going to run right up to the coast then come to a halt. 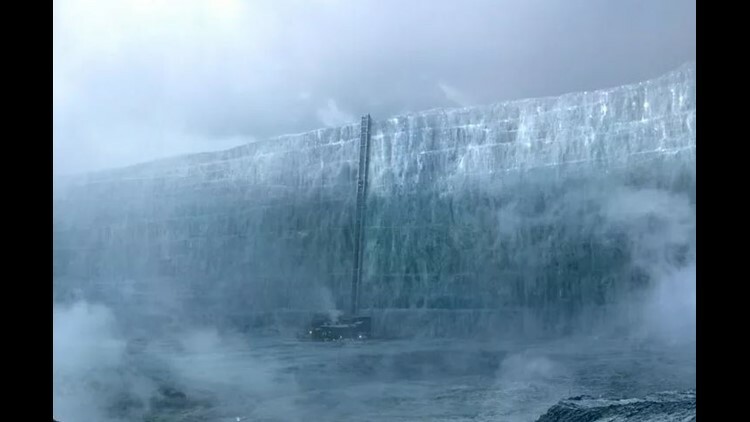 That Arctic air is going to act like the wall from Game of Thrones, nearly impenetrable. 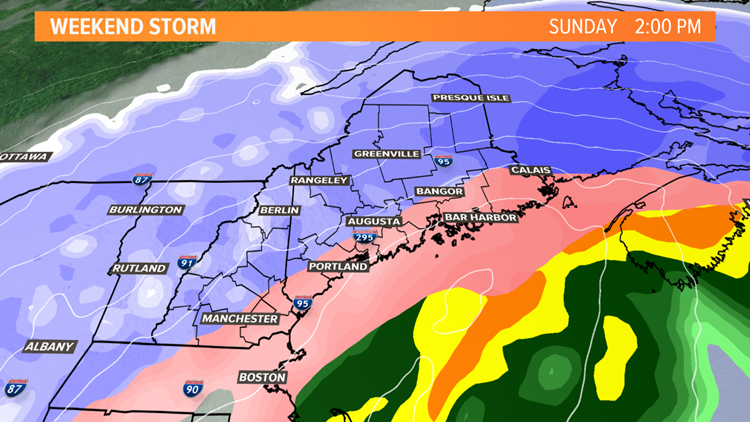 By the afternoon, the wave of low pressure will be sliding by and any mid-layer warmth will erode back into the Gulf of Maine, snow takes over again. The intensity of the snow will start letting up but the snow will keep falling right on into the evening. I do expect the snow to taper off between 8 PM and midnight, although with the wind whipping the snow around it will still appear as if it’s snowing, hampering clean-up efforts through Monday. 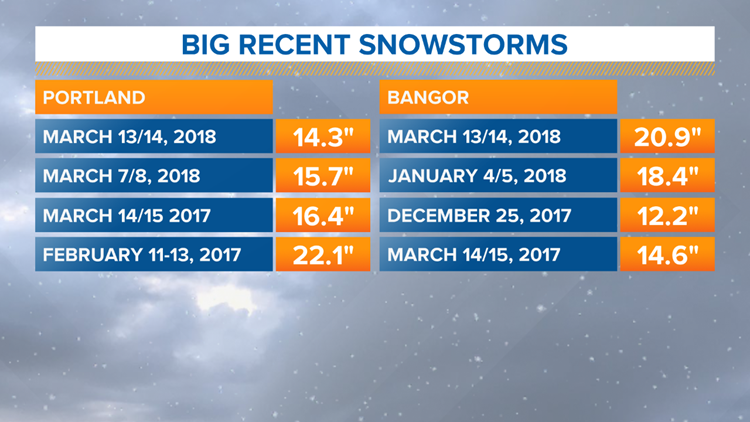 Here’s a list of some of the biggest storms over the last couple years. This one is going to make a run at those numbers. My biggest concern, always, with winter storms is the power outage potential. The thought of boilers and pipes freezing is every homeowner’s nightmare. Thankfully, if we mix with ice it’s only sleet and sleet doesn’t cling to limbs and lines. Even though there’s going to be a lot of snow, it’s not the wet kind that cakes to things. So it’s just the wind that can cause problems with this event. 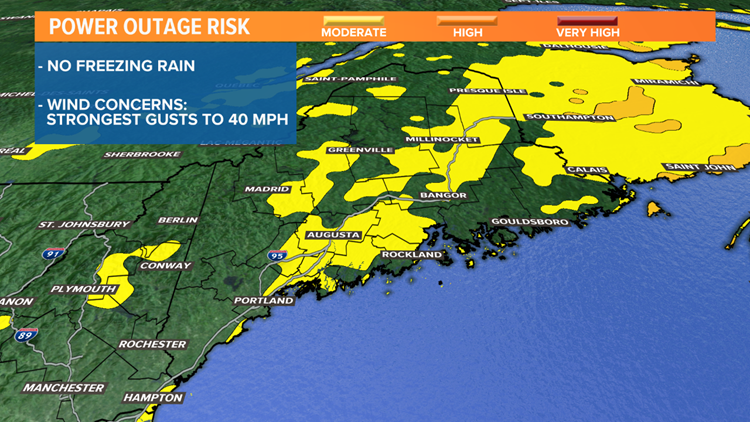 Gusts could reach 40 mph out of the NE on Sunday and out of the NW on Monday. Enough to cause some outages, but I’m cautiously optimistic we’ll avoid major problems. Stay with the NEWS CENTER team for the latest as this storm approaches. You can follow me on Twitter & Instagram.